On Monday, nearly 80,000 Syrian refugees gained access to a critical source of power, allowing them to turn on fans and lights, recharge phones, watch TV, and even run a fridge. 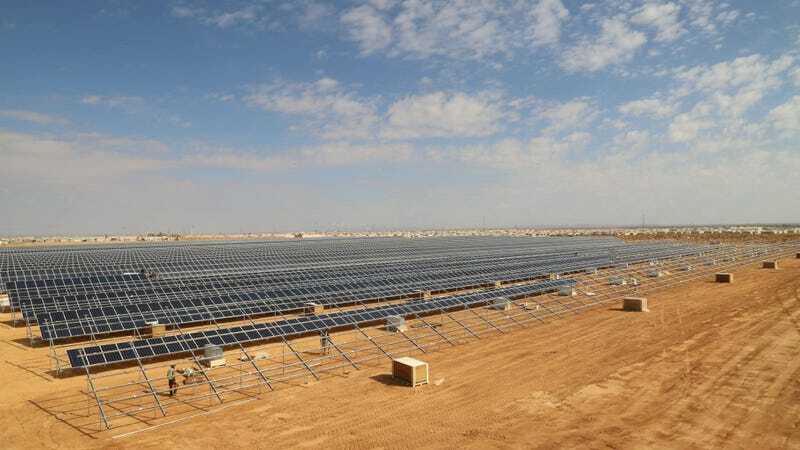 According to the United Nations, the 12.9-megawatt solar plant at Zaatari refugee camp on the border of Jordan and Syria is now the world’s largest solar plant in a refugee camp. According to Reuters, the “15 million euro ($17.50 million) project, funded by the German government, will provide electricity in Zaatari camp for up to 14 hours a day.” The 40,000 solar panels will also help lower the Office of the United Nations High Commissioner for Refugees (UNHCR) annual costs by as much as $5.5 million. According to The Jordan Times, over 75 refugees worked alongside Jordanians to install the solar panels, gaining new skills and additional income. The impact of the new power source will be felt immediately. “Right now, we only have electricity from around six in the evening until three in the morning, and there are lots of things we need the power for: using the washing machine, charging our phones and watching TV,” she said. Stefano Severe, a UNHCR representative in Jordan, told Reuters that the renewable power source will also allow children to do more schoolwork and will create a safer environment for women and girls. “Camp life will be made much easier,” he said. While this comment may not have been a direct response to U.S. Secretary of Energy Rick Perry’s suggestion earlier this month that fossil fuels are helping create safer spaces in impoverished communities across Africa and the Middle East, it’s a powerful example of what’s actually happening on the ground. Perry was roundly criticized for his remarks, with many pointing out that fossil fuel-driven climate change is exacerbating humanitarian crises, such as the one in Syria, where devastating drought has been a major factor. “Women, and particularly women of color, are among the most severely impacted by the climate crisis, and it is these same communities that are most at risk of sexual assault,” said Michael Brune, executive director of the Sierra Club, in a statement at the time. According to the UN Refugee Agency, climate change is a “threat multiplier” in many conflicts today, including Syria’s, where a five-year drought preceeding the ongoing war displaced some 1.5 million people. “Climate change sows seeds for conflict, but it also makes displacement much worse when it happens,” states the agency. A recent report from the Environmental Justice Foundation determined that over the course of the next decade, tens of millions of people will become climate refugees, “creating the biggest refugee crisis the world has ever seen,” as The Guardian put it. Solar-powered refugee camps offer a rare bright spot amidst these harsh realities. Other camps in Jordan and African countries like Kenya are also turning to cheaper, cleaner solar power to help improve life while a longer-term solution is sought. Update: A previous version of this post included statements from outside sources that were not properly attributed. The text has been updated to clarify the source of the language and properly attribute it.